Every year brings certain milestones to the Carolina hiker’s calendar. The emergence of spider lilies at Landsford Canal, the first snow on Grandfather Mountain, and, of course, the multi-hued spectacle of autumn leaves that blanket both Carolinas. But late spring is the season of the rhododendron. Throughout late May and June (low elevations bloom first), the quintessential Carolina shrub bursts with brilliant color, decorating trails and covering hilly bluffs with their huge blooms. While several types of rhododendron exist, including azaleas, three are very often responsible for electrifying the views from Carolina trails. The Catawba rhododendron (Rhododendron catawbiense) is found in the highest elevations of the Carolinas. These are often what you see covering patches of highland balds. While their blooms can show pink or white, their most famous hue is a soft purple or bright raspberry. In lower elevations, the Rosebay ( Rhododendron Maximum ) often create huge tunnels or walls along shaded mountain trails. As an evergreen, the large, waxy leaves of the Rosebay add a welcome green complement to otherwise brown winter hikes. At lower elevations, Rosebay blooms tend toward white but in higher, sunnier spots their petals are a soft pink. For sheer brilliance, the blooms of the aptly named flame azalea (Rhododendron Calendulaceum) have few rivals. The fiery red or orange flowers of this large shrub are often found adjacent to Catawba rhododendrons in high mountain meadows, creating an otherworldly exhibit of multicolor flora. But as you trek to find these beautiful flowers, keep in mind that the rhododendron can be a dangerous beauty. Many varieties contain a poisonous substance known as grayanotoxin, which is especially concentrated in the leaves and can cause such nasty symptoms as nausea, muscle weakness, impaired vision, and serious heart issues. And honey made from its flowers is sometimes known as "mad honey” for the hallucinations that it can cause (small quantities are sometimes ingested for this purpose). According to some historical accounts, armies centuries ago even used it as a weapon of war against their enemies, since it rendered them virtually defenseless. So it should go without saying for hikers on the rhododendron trail: Look, but don't touch, and certainly don't taste, these resplendent blooms. 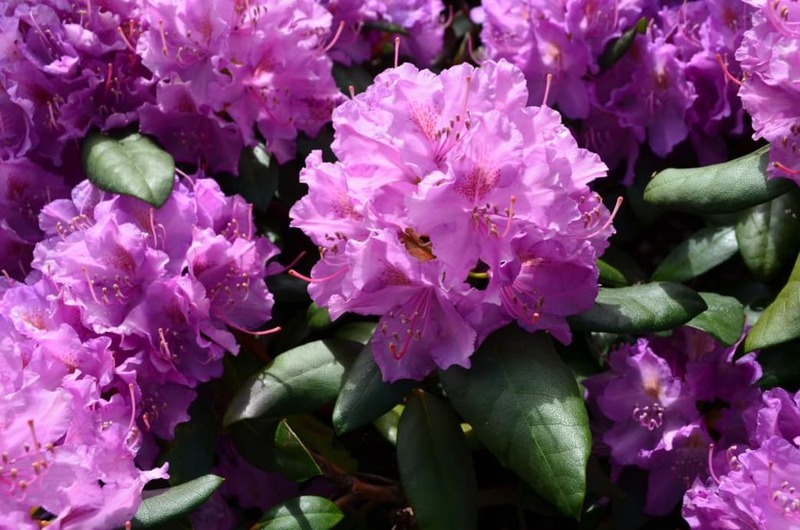 From mountain tops to backyards, the rhododendron is a familiar sight across the Carolinas (and in some neighboring states, too); finding them is not a difficult task. But for either sheer numbers of plants or the stunning backdrops that frame their beautiful blooms, these rhododendron hangouts are among the best places to catch an eyeful of these showy shrubs. With soil that is generally inhospitable to Catawba and Rosebay rhododendron, flame azaleas take center stage at Elk Knob State Park . It’s one of the newest state parks in the North Carolina system, with just a few trails available, and only one to the 5,520-foot summit of Elk Knob. The mostly moderate (there are a few steep sections), four-mile round-trip hike to the top makes this one of the most accessible azalea viewing locations on the list. The remote feel and amazing views from Elk Knob offer a fantastic effort-to-reward ratio. Made famous by the 600-foot granite dome that erupts from the rolling countryside surrounding it, Stone Mountain State Park is also home to a sizable community of hearty rhododendron. Many can easily be spotted along the 18-mile trail system. A popular and rewarding hike at SMSP is the 4.5-mile Stone Mountain Loop Trail. The near constant uphill at the beginning of the loop leads to expansive views from the sheer rock face of the park’s namesake mountain. Further on, the trail leads to a 200-foot waterfall and more rhododendron viewing opportunities. Each June the large grassy meadow that caps Gregory Bald in the Smoky Mountain National Park ignites with thousands of fiery azalea blooms. A relatively tough 5.5-mile hike (one way) leads from near the Cades Cove Visitor Center in the western part of the park to the edge of Gregory Bald. Views of Cades Cove to the north form a stunning backdrop to the brilliant bushes. Although the 11-mile round-trip walk is certainly attainable as a day trip, an overnight stay at backcountry site number 13 offers a whole different experience. The high vantage point provides an eagle-eye view of valleys painted in deep crimson as the sun sinks low on the horizon, making Gregory Bald one of the most dramatic dinner spots in the Smokies. Keeowee Toxaway State Park is one of those oft-overlooked gems of the Carolinas. Built along the shores of Lake Keowee, the small park offers access to its crystal waters. Inland, two dozen campsites are tucked in among towering tree cover, creating the perfect shade for spring camping. These same woods harbor a substantial collection of rhododendron. Two trails lead through the forest and offer up-close views: The 1.3-mile Natural Bridge Trail and the 4.4-mile Raven Rock Trail. One of the greatest features of Keowee Toxaway SP is its proximity to a number of other parks. 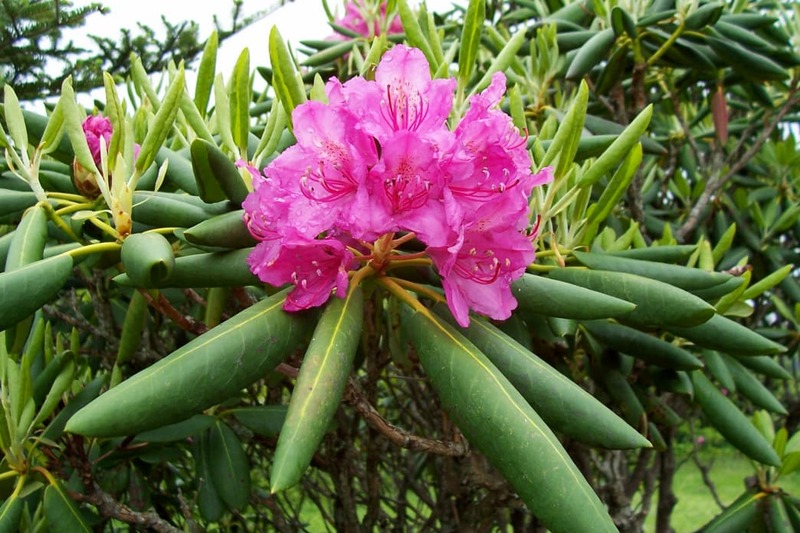 About a 20-minute drive from the shores of Keowee, Table Rock State Park exhibits two types of Rhododendron. Rosebay show in June near the back side of the park road and rhododendron minus, with its shorter leaves and pinkish/lavender blossoms, blooms in May along the Carrick Creek Trail. By far, Craggy Gardens is the most easily accessible spot on this list. The trailhead for the 1.4-mile Craggy Trail is less than 30 minutes’ drive from Asheville, NC. This high-altitude panoramic powerhouse showcases huge thickets of Catawba rhododendron, whose bright blooms contrast with the exposed gray rock of the Craggy Mountains. As you might imagine, this beautiful spot is quite popular. For a more intimate viewing, try making it out just after sunrise. Not only will the crowds be thinned, but the golden tones of early morning are the stuff of photographers' dreams. The famous rolling balds of the Roan Mountain Highlands are home to one of the greatest Rhod-shows on earth. Topping out at well over 5,000 feet, these wide open meadows offer the perfect nexus of unfettered sun and high altitude, which allows Catawba rhododendrons to show off their finest foliage in a deep raspberry hue. The easiest way to lay eyes on this spectacle is by touring the natural rhododendron gardens. There’s a small fee to enter, but inside you’ll find a short path that places visitors among huge stands of the towering shrub and offers tremendous views from an observation deck. Another option requires a five-mile roundtrip hike up and over three contiguous balds: Grassy Ridge, Round, and Jane. The view from these rounded peaks is tremendous. 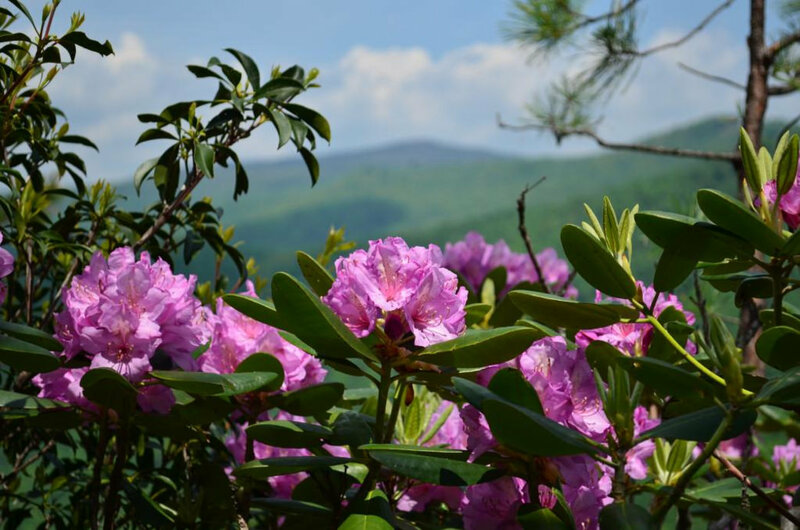 Throughout June, you’ll spot photographers hauling gear from the parking lot at Carvers Gap to the top of the balds, capturing the stunning display of rhododendrons that surround each one. Finally, if you’re willing to put in the work, the 14-mile stretch of Appalachian Trail between Carvers Gap and highway 19E traverses several other high altitude balds, ducks under alpine forests, and burrows through tunnels of rhododendron and mountain laurel. This ultimate Roan experience requires a car drop and is a good challenge for even healthy hikers, but is often considered among the most iconic walks in the country. While in the area, why not join in the flower-centric festivities? 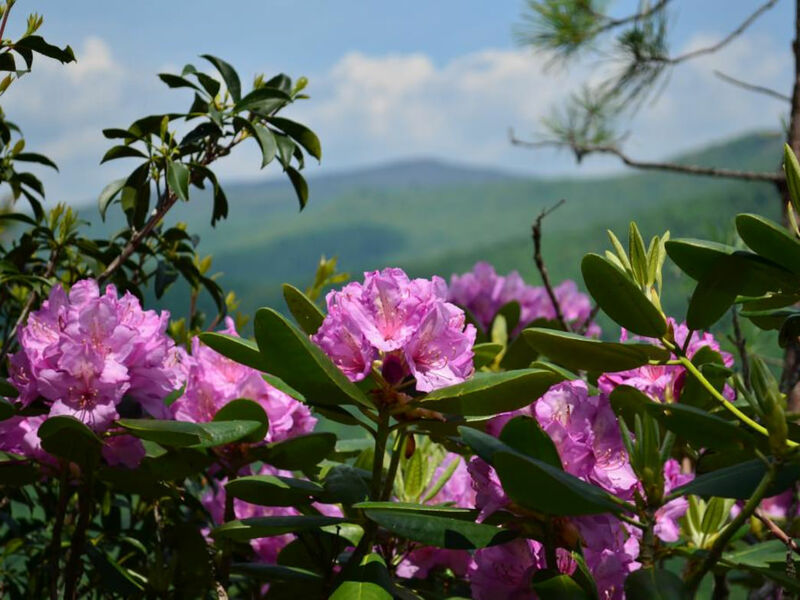 Held continuously for more than six decades, the Rhododendron Festival at Roan Mountain celebrates the yearly bloom in proper highland fashion. All the best local crafts, mountain music, historic demonstrations, and fair food are presented each June for a perfect ending to a Roan exploration.